Haiti, one of the least developed and most vulnerable nations in the Western Hemisphere, made the international headlines in January 2010 when an earthquake destroyed the capital, Port-au-Prince. More than a year later, little reconstruction has taken place, in spite of a strong international funding commitment. 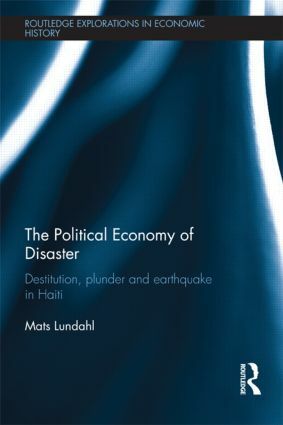 Mats Lundahl has written several seminal works on Haiti, and this volume brings together the best of his past work on Haiti’s economic and political history, along with a comprehensive introduction and two new chapters which bring the story right up to the present day. Together, the volume provides both historical background and explanation as to why Haiti was so badly affected by the earthquake, and to why reconstruction efforts have been ineffective this far. Lundahl argues that the two main causes can found in the interaction between the growth of the population and the destruction of the arable soil on the one hand, and in the creation of a predatory state during the nineteenth century, which still exists to this day. This book provides a comprehensive analysis, which charts these themes from the time of the arrival of Columbus in the island in 1492, to the present day. The book also deals with contemporary market and policy failures, as well as the crucial recent elections, and considers the path ahead for this impoverished nation. This book will be of huge relevance and interest not only to students and researchers in economic history, but also for all those working on development economics, development studies and American and Caribbean Studies more generally. Mats Lundahl is Professor of Development Economics, Stockholm School of Economics, Sweden.